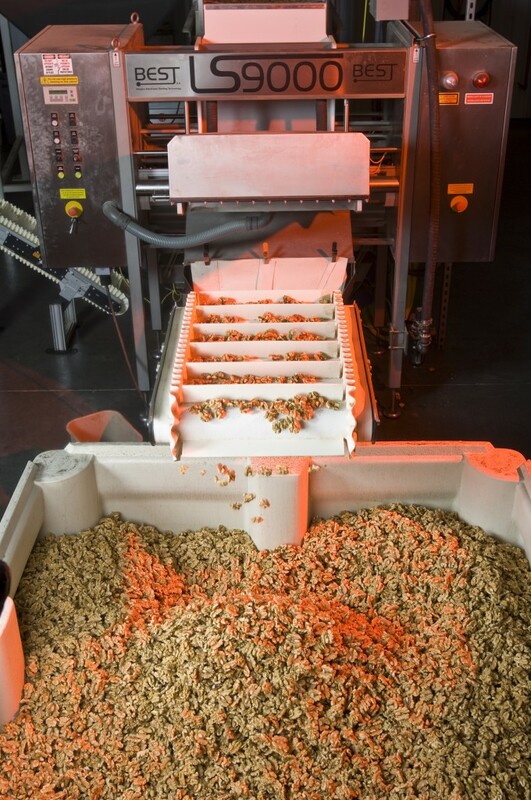 Shelled walnuts are sorted and separated in the Best Laser Sorter. It takes daily vigilance and commitment to maintain a clean, safe processing facility. We are fortunate to have a large, talented pool of employees who take the utmost care in maintaing our QA and food safety standards every single day. From the orchards to the packaging department, every step we take is focused on providing the world’s highest quality California walnuts to our customers. We follow the globally recognized Good Manufacturing Practices (GMP) and Hazard Analysis and Critical Control Points (HACCP) systems to ensure that quality with food safety takes precedent in all of our operations. This science-based, preventative system identifies, evaluates and controls hazards to food safety. It covers the complete production process from the receipt of raw materials to distribution. Our systems are verified and audited by independent organizations to prove conformity and compliance with the highest food safety, regulatory and quality requirements. We currently use SQF as our Quality Management System for its thorough approach to food safety practices. The SQF guidelines provide comprehensive food safety and food quality as well as challenge our entire team to keep improving.